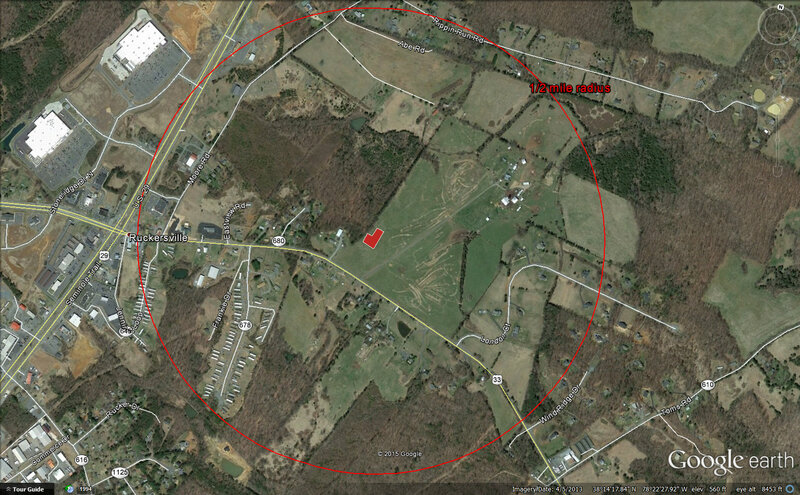 1/2 mile range rings from the proposed site to show how close it is to residential areas and the city center. Is there another outdoor gun range anywhere in the US this close to a city’s commercial district? Yellow – Residential. Purple – Churches. Blue – Commercial. Red – Farm. Green – Gun Shop Property. 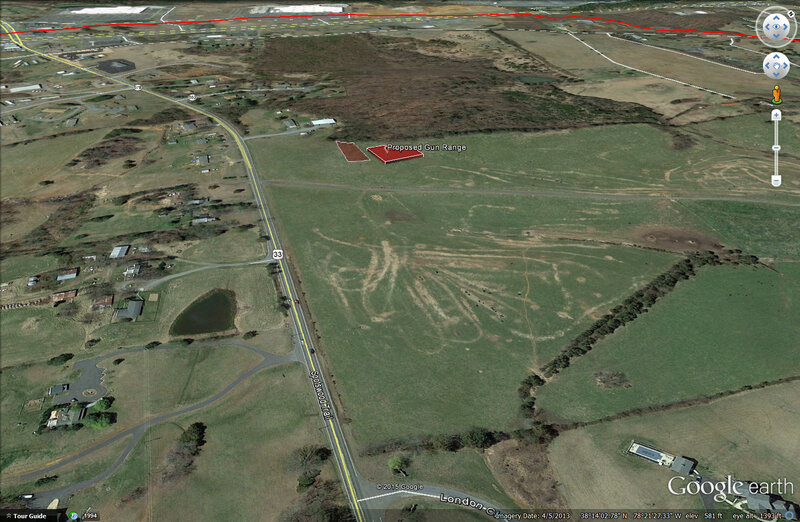 This view shows what is within a half mile radius of the proposed gun range (in red). It includes over 100 residential homes, several school bus stops, two churches, and what most would consider the Ruckersville city center at the intersection of Rt 29 and Rt 33. 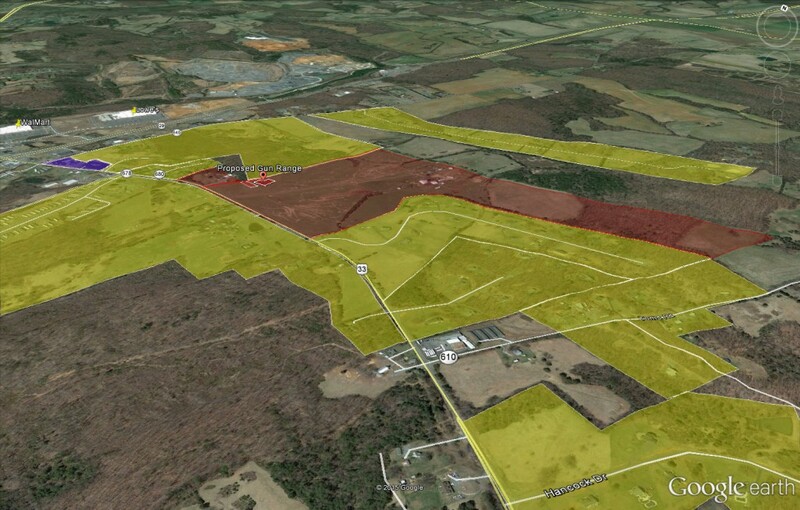 This depicts, in yellow, the residential properties immediately surrounding the proposed site. Purple areas are churches. Red areas are owned by the authors of the proposal. There are over 100 residential homes on these properties. This shows how the pastoral and rural nature of the area can be affected. What is now a serene agricultural area that greeted drivers on Route 33 coming in from Orange County is proposed to be a parking lot and an approximately 20,000 sq ft structure not in keeping with the area. Well put! The majority of your neighbors in Hancock Farms are with you! This is the WRONG location for a shooting range as it is TOO CLOSE to private residences, churches, school bus stops and major traffic routes. The noise WILL NOT be reduced to the point where people in these locations are not impacted. This is an OUTDOOR firing range no matter how you design it. The sound of gunfire from 20 shooters firing at the same time with different calibers and types of weapons will be distracting and perhaps even frightening to people. This will not create a sound that is equivalent to “a barking dog” as claimed in the proposal for the range. It will be a loud and prolonged staccato of gunshots for hours on end and potentially 7 days a week – not a solitary barking dog – due to the factors I will now describe. The firing line will run for a period of time until a ‘cease fire’ is called by the Range Master so shooters can go down range to check their targets. Shooters will then go back to their firing positions and the Range Master will make the line ‘Hot’ so firing can recommence. This cycle goes on as long as the range is open for operations. With no stated limitation on weapon type or caliber, it is conceivable that fully automatic weapons – machine guns, sub-machine guns, M-16’s and AK-47’s – will add to the sounds church goers, school children, people in cars and home owners will hear. Even semi-automatic versions of these military grade weapons will be significant in their noise profiles. The sharp and loud report from a .50-caliber Browning Machine Gun round http://en.wikipedia.org/wiki/.50_BMG or the report from a .700 Nitro Express http://en.wikipedia.org/wiki/.700_Nitro_Express will really stand out. When all of this noise and the described pattern by which it will be made is added to knowing what is causing it WILL IMPACT people trying to worship, live in their homes and yards and drivers. Another major point is that the proposed range with its noise, disruption of traffic patterns and firearm safety concerns (accidental discharges and potential “Chris Kyle” incidents) will affect church goers and home owners who were in place FIRST. Do you think for a moment that a church, business or a home owner would build in the proximity of a 20 point firing range? I don’t think so. With the change in the character of the land if the range is built makes it doubtful that anyone else will either. I base my position on being a user of shooting ranges for over 40 years in military, law enforcement and personal applications. I am a LIFE NRA member since 1977 and was a Federal Law Enforcement Training Center (FLETC) trained and certified Firearms Instructor for 22 years. 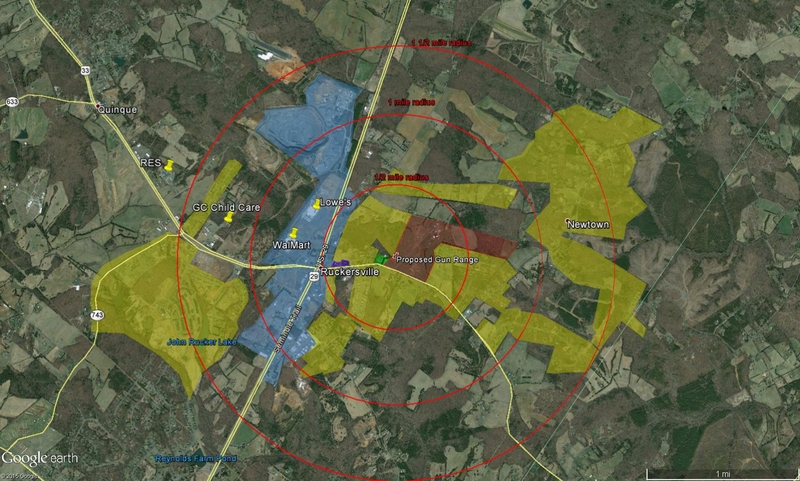 I know ranges and firearms and have no doubt this range if built will affect people in the area. The added profit to a business owner and the convenience to a very, very small number of shooters does not justify the disruption of the lives of Greene County citizens who built first their houses of worship and family homes due to the tranquility and beauty they saw. They deserve and are entitled to live their lives as they envisioned.